It's your chance to become the Grand Poobah of the Royal Order of Water Buffaloes! All you have to do is find The Treasure of Sierra Madrock. So stop stalling and start searching! --From the SNES Flintstones: The Treasure of Sierra Madrock instruction manual. 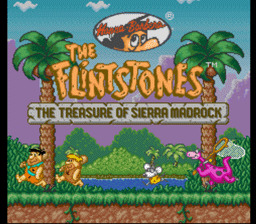 Play Flintstones: The Treasure of Sierra Madrock Now!